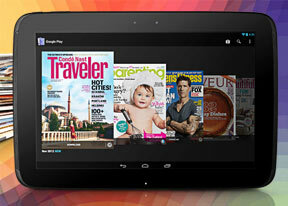 The Google Nexus 10 has no hardware controls at the front - it doesn't need any with Android Jelly Bean inside. All you get here is the 1.9MP front camera and some sensors. There's also an LED notification light below the screen. The two front-facing speakers are either side of the screen. We found this location to much better suit gaming and movie watching than the sides or the back of the slate. The grilles stretch to almost the same length as the tablet, but the speakers themselves are positioned in the upper half of the tablet, so covering them with your palms when holding the slate is not likely to be an issue. At the top (in landscape) we the Power/Lock button next to the volume rocker. The microphone is at the bottom, inside the dock connector. On the left side we find the microUSB port and the 3.5mm audio jack. We can't really stress enough how happy we are that Google has once again used a standard USB connector, instead of a proprietary one like most other OEMs. With microUSB cables and chargers so easy to find these days, the standard port means that you'll easily be able to hook up your Nexus 10 to just about every computer out there without having to carry the cable at all times. You might also be lucky enough to find a powerful enough charger to top up your battery, but as we said, most of those that are meant for smartphones will take ages. The Nexus 10 doesn't have an MHL-enabled port so it doesn't offer TV out via USB, but it has a dedicated microHDMI port on the right, which is actually a way better solution. microHDMI to HDMI adapters and cables are a dime a dozen these days, so you'll be able to cheaply connect your Nexus 10 to your TV and stream movies or games. At the back of the Nexus 10 we find a 5MP camera with an LED flash next to it. The camera is quite capable of shooting the occasional photos and HD videos as long as you are willing to put up with looking weird doing it with a 10-inch slate. There's also a second microphone pinhole below the camera, but it's used for noise cancellation only and there's no stereo sound recording in videos. The Google Nexus 10 is powered by a 9000 mAh Li-Ion battery. By Google's estimates, it will give you 9 hours of multimedia playback. In our tests the tablet managed just over 8 hours of video playback and 7:35h of web browsing. Not exactly what Google promised, but not too bad either. The Google Nexus 10 can be held with one hand and operated with the other, but at just over 600g you will soon need to find some kind of support. The rounded corners are great - noshrap edges rubbing against your palm like with the heavier metal-clad iPad. However, the landscape position is the only one that feels really natural on the widescreen slate. The Nexus 10 is just too tall for comfortable portrait hold.